What are the risks of aHUS? 1. Laurence J, et al. 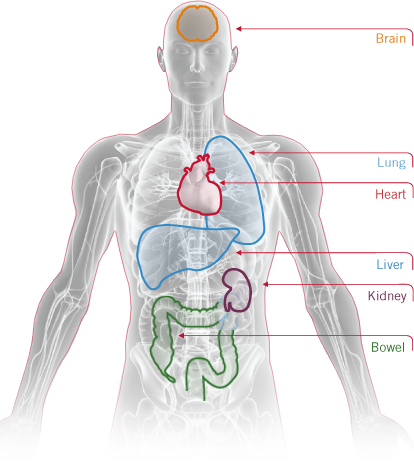 Clin Adv Hematol Oncol. 2016;14 Suppl 11(11):2-15. 2. Legendre CM, et al. N Engl J Med. 2013;368(23):2169-2181. 3. Sellier-Leclerc A-L, et al. J Am Soc Nephrol. 2007;18(8):2392-2400. 4. Noris M, et al. Nat Rev Nephrol. 2012;8(11):622-633. 5. Noris M, et al. Clin J Am Soc Nephrol. 2010;5(10):1844-1859. 6. Caprioli J, et al. Blood. 2006;108(4):1267-1279. 7. Cofiell R, et al. Blood. 2015;125(21):3253-3262. 8. Muus P, Loirat C, Licht C, et al. Presented at: 18th Congress of the European Hematology Association. June 13-16, 2013; Stockholm, Sweden. Abstract B1774. 9. Jamme M, et al. PLoS One. 2017;12(5):e0177894. 10. Stahl AL, et al. Blood. 2008;111(11):5307- 5315. 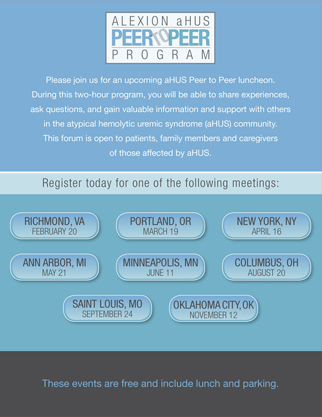 Speak with a Registered Nurse Case Manager about aHUS.